A full-featured DJ app can be yours for fifty bucks, and it can stream the songs you don’t have right off Spotify. djay Pro is here, and with it and a new generation of contenders come some serious shifts in digital DJing. 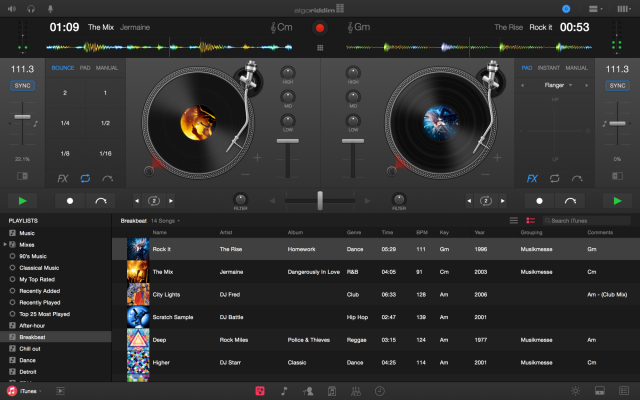 Algoriddim have been making user-friendly DJ apps for a while. That started with a beginner-friendly Mac app, but extended to iOS and the until-recently-neglected Android platform (which is now at last fairly viable for mobile DJing). djay’s ease of use was already enough to make it appeal to casual DJs. Then, in May, Algoriddim pulled an ace out of their sleeve – Spotify integration. You still need a reliable WiFi connection, and streaming still isn’t quite as convenient as working from downloaded files, but for wedding DJs or anyone who has to take requests, it’s a boon. Still, mobile gadgets are limited. Connecting hardware for control and sound is a pain compared to a desktop, and storage is restricted. Today’s release of djay Pro is a serious salvo in the exploding DJ market. There are two big bombshells. One, Spotify DJing has just become a reality on desktop. Two, big players in the DJ market now have to contend with a friendly, affordable competitor. And I don’t think that’s something to underestimate. In a world of DJ apps that looked like they were designed by Airbus engineers, djay (like rival Cross) represents something anyone can approach. Now, previously, that meant giving up some features serious DJs needed. But djay Pro closes a lot of that gap, without looking more complex. Should makers of big DJ apps be a little worried? Absolutely. DJing is an expanding global market, and that puts lots of users on the table – and Spotify means some of those DJs would consider switching platforms. 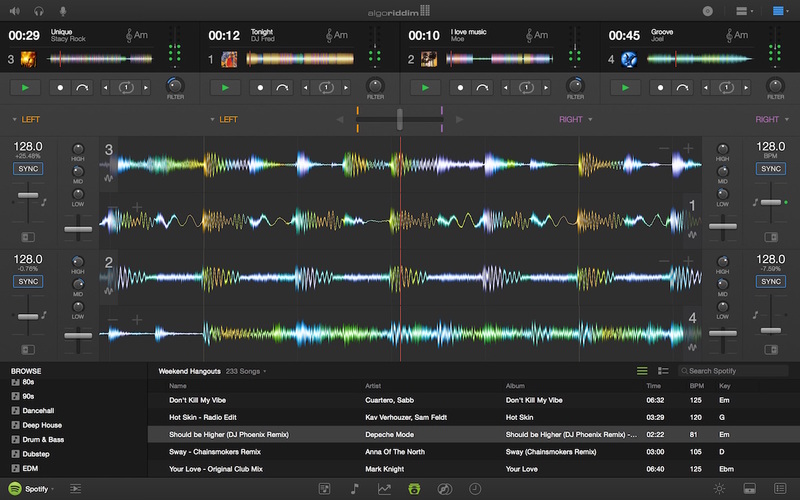 Traktor, which has cool-looking hardware but can be inflexible in what appears on the screen, I’m looking at you. Native Instruments’ own iOS efforts have shown that Traktor’s user experience could be better. Spotify Integration: instant access to over 20 million songs. Effects are one area where something like Traktor is miles ahead – but Sugar Bytes makes great effects, so this is a horse race now. And it’s likewise nice to see some hardware control options. Spotify, though, is really the wild card here. Cross DJ for Mac and PC – which offers the Windows support lacking here – is another major contender, and one I hope to write about in the next couple of weeks. It has deeper sampling and remix options, lots of Pioneer integration (important to those aforementioned “pros”), and vinyl control. Here’s where things get interesting: Cross DJ does unlimited SoundCloud streaming, in place of Spotify. Pricing runs from free (!) up to US$129, with most functionality in the US$34 version. You may have noticed Native Instruments steeply discounting their software lately. I really wonder if DJ software will get commodity pricing while makers like NI make up the difference on hardware. By the way, this makes the news from Beatport this week even more interesting. Beatport downloads face competition direct from artists and labels – and streaming, too. The streaming service they’ve teased to The Wall Street Journal still isn’t available, while producers and labels are already used to uploading music to SoundCloud (where they have actual control over their content) and the public are used to Spotify. With Spotify and SoundCloud already integrated with these products, you wonder where the Beatport offering will even fit. 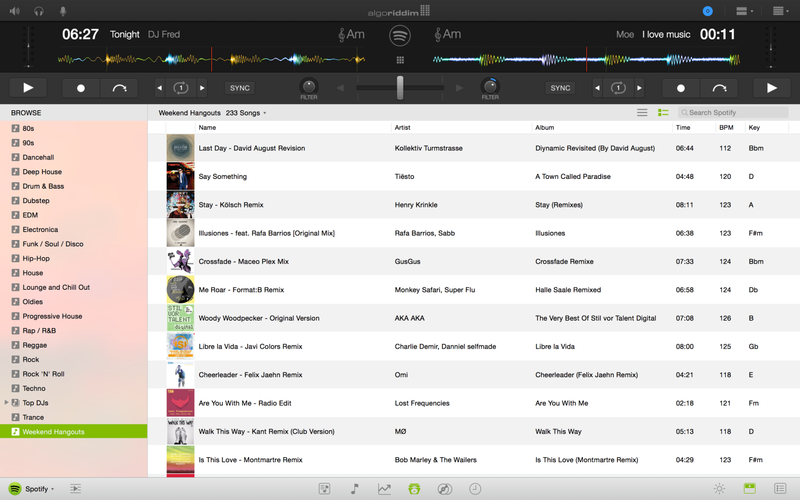 Beatport has been integrated with Traktor before; maybe it’ll happen again. Otherwise, it seems like SoundCloud and Spotify may remain the bigger streaming players, with Beatport some sort of Raver Spotify for the Tomorrowland set. Right now, djay Pro is a nice contender for casual DJs, for anyone wanting a fresh-faced app, or anyone who wants Spotify integration on the desktop. I look forward to reviewing this one. 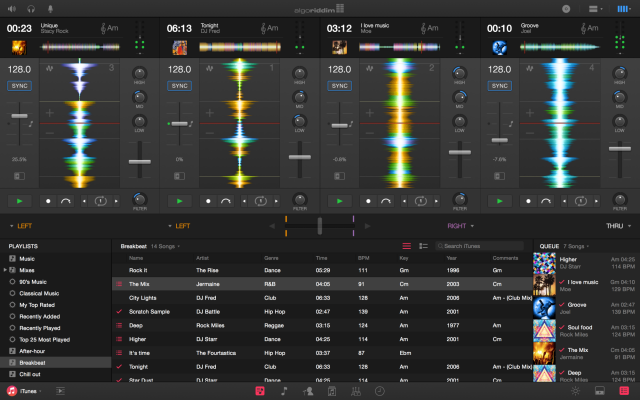 djay Pro is for sale via Apple’s App Store at US$49.99, for a limited time.